Unwanted fat in the upper arms causes great distress for many women. (Men do not tend to deposit fat in the upper arms.) Many women who suffer from “bat wings” or “flabby arms” restrict their wardrobe by wearing garments that completely cover the arms, even in the heat of summer. Most of these women have tried dieting, exercising and creams to no avail. So what causes some women to have unwanted fat in their upper arms? Four main factors, or a combination of the four, lead to excess fat in the upper arms. The first and most obvious reason is being overweight. Your body converts calories that are not utilized for energy into stored fat. You eat more calories than you use, you gain fat. One of the primary places women store excess fat is the upper arms. That’s the reason for using the upper arms for testing body fat percentage with calipers. After gaining the excess fat in the upper arms, it is difficult to get rid of. Though the body generally tends to get rid of fat from the periphery (arms, legs, face) first, arm fat proves difficult to get rid of with diet alone. Also, arm fat tends to be resistant to exercise-induced fat reduction. Moreover, most experts agree that spot reduction is not always effective. The aging process plays a role in problems with the accumulation of upper arm fat. As we age, our metabolic rate slows. We burn fewer calories which makes us more prone to gaining unwanted fat. We also lose muscle mass. With the muscle atrophy accompanying our getting older, our arm muscles (biceps, triceps and deltoid) shrink and weaken due to loss of size, strength & tone, and may even “shake” when we move our arms. Moreover, as we get older we produce less collagen which can lead to flaccid or loose, hanging skin. Take the added fat with the lessened muscle, add the loose skin and the result is unattractive, large upper arms or “bat wings.” Aside from exercise to maintain tone, strength and size of the arm muscles, we cannot reverse the aging process without medical intervention. As with all other physiological processes, genetics or heredity dictates whether we suffer from the distress of upper arm fat. How and where your body deposits accumulated fat is dictated completely by genetics. Your genetic makeup directs your body type. If you have an apple shape (tending to carry excess fat in your upper body and abdomen), you are more likely to have jiggly arms. Your genetic makeup also dictates your hormonal functions/dysfunctions. Hormones influence body fat distribution. If you are estrogen dominant or have a low level of human growth hormone, you will have a higher association with fat in the upper arm. Most of the time, we can control our weight, but we require assistance from medical professionals to address our hormonal issues. Finally, the fourth factor associated with “bat wings” is a history of either losing a lot of weight or a rapid weight loss. After skin has been excessively stretched (as when overweight), it loses its elasticity. Exercises to build, tone and strengthen our arm muscles will improve appearance to a certain degree, but will not improve our skin elasticity. And as previously discussed, arm fat tends to be resistant to exercise-induced fat reduction. Medical intervention becomes necessary to improve excess arm fat and loose skin caused by rapid weight loss or extreme weight loss. Now that you know the causes of unwanted fat in the upper arms and the very little control you have to correct the problem on your own, you need to know that the medical professionals do have treatments to assist you. 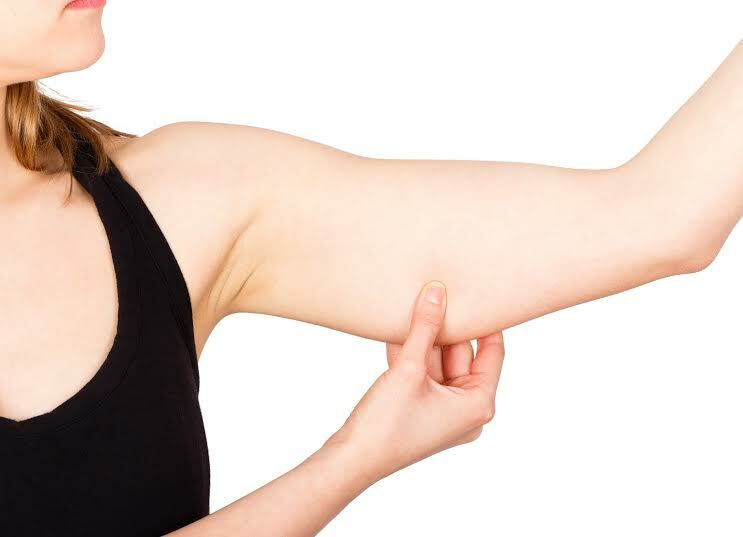 Stay tuned for Part 2B wherein we provide you with information about the choices you have to reduce your unwanted upper arm fat and tighten loose upper arm skin.